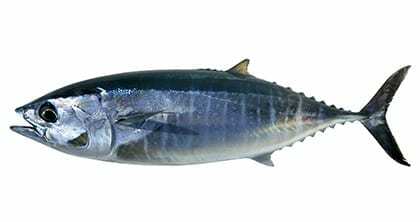 Considered the king of the bony fishes, tuna are impressive in both size and flavor. With the largest tunas weighing up to 2,000 pounds, their gargantuan status transfers to a powerful taste on your menu. Enjoying the tangy flavor of a seared steak or the clean taste of sashimi is a favorite pastime of for any seafood lover. Tuna are packed with omega-3 fatty acids, creating a nutritious and hearty meal for your diners. Whether your tuna comes fresh, frozen or canned, there are a multitude of delicious options for preparation. Tuna melts, seared tuna steaks or raw sushi and sashimi are only just a few traditional favorites that will make lovely additions to your menu. Each species has a rich, meaty taste with large flakes and intense flavor. With fresh tuna, it will behoove your chef to treat it like sirloin steak, as your diners will best enjoy it a bit rare for full flavor. Choosing your tuna can be a tricky business at best. Most species tend to be highly migratory, which means that cooperative international management is needed to ensure sustainability. Many populations have sadly been overfished, yet there are still many healthy and well-managed fisheries. Troll and poll-and-line caught fisheries tend to be much more sustainable than longline fisheries, which can accumulate bycatch. Here at Pucci Foods, we care about our oceans and strive to support fisheries that sustainably source these powerful creatures. Let us choose your tuna for you and trust that our products are the most sustainable and healthy seafood options on the market. Order your tuna by filling out the form on this page and our team will be in touch soon.